This recipe came from my Mom. It was published in a church cookbook many years ago. It is so easy to make and so easy to eat. Yum! I thought my sausage was mild, but undoubtly not. It was a bit hot for my taste, so next time I will be sure to use mild sausage. Or, maybe I’ll try bacon or ham next time. In skillet brown sausage. Separate crescent rolls in triangles on pizza pan. Press edges together. 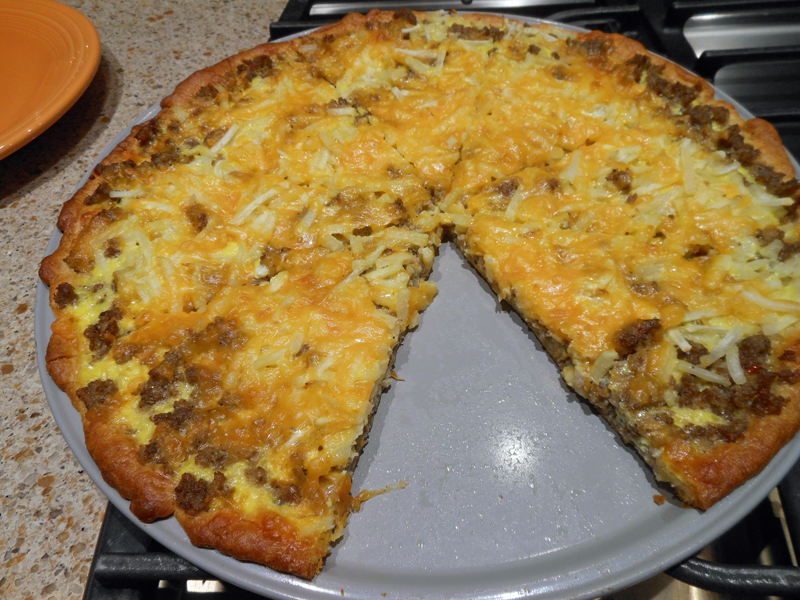 Spoon sausage over crust. Then hash browns. Add cheddar cheese. Beat eggs, milk, salt and pepper. Pour on crust. Bake at 350 degrees for 25 – 30 minutes. been looking for something like this …..yum!! !